L’elisir d’amore of 1832 is one of Gaetano Donizetti’s most popular and light-hearted works. Set in a village in the Basque Country at the end of the eighteenth century it sees the humble Nemorino love the landowner Adina, even as she tells him she is fickle and that he should forget her. When, however, she reads the legend of Tristan and Isolde, Nemorino is inspired to ask travelling quack doctor Dulcamara if he has any of the potion that enabled Tristan to win his love. Dulcamara says that he does while selling Nemorino half a bottle of Bordeaux. He also tells him that it takes twenty-four hours to work, by which time he plans to be well away from the village. When Sergeant Belcore arrives on a recruitment drive he attempts to woo Adina. She agrees to marry him, but only to teach Nemorino, who has feigned indifference towards her while he waits for the potion to work, a lesson. Nemorino is scared that the wedding will take place before his potion has worked its magic, but then news spreads (though not to Nemorino or Adina) that Nemorino’s rich uncle has just died, leaving him with a fortune. Nemorino suddenly finds that all of the women of the village are chasing him. He erroneously believes this is a result of the potion, and enjoys his newfound popularity as much as Adina discovers she hates it. This forces her to admit that she loves him, and the pair come together after which Nemorino learns of his inheritance. Thus, as Belcore blithely declares that there are plenty more fish in the sea, Dulcamara finds a new market for his ‘elixir’, which he now claims helps people to find wealth as well as love! This is the fourth revival at the Royal Opera House of Laurent Pelly’s 2007 production, and although in Daniel Dooner’s hands certain aspects feel rough around the edges, these never seriously undermine its underlying dynamism, or the inherent strength of the performances. 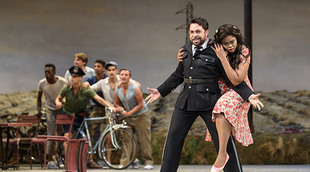 Jonathan Miller’s 2010 production for English National Opera sets the action in the American Midwest while the Royal Opera places it in Italy, but both set the drama in the 1950s. Productions of many operas, in fact, employ this period and the reasons why are fairly obvious. The decade is still recent enough to retain a certain air of familiarity, but also sufficiently ‘historical’ to maintain many of the traditional values and hierarchies that the works originally played on. Generating a strong sense of the rural, Chantal Thomas’ set is piled high with bales of hay that create a variety of levels upon which to perform the comic arias. ‘Come Paride vezzoso’ sees Belcore come crashing down on the hay in his attempts to woo Adina, while during ‘Chiedi all’aura lusinghiera’ Nemorino throws himself in front of her Vespa and then attempts to ride pillion behind her. While the hay bales are in many ways effective, they initially take up so much space that they make the stage feel cluttered and devoid of any real purpose. A parallel point could be made with regards to the choreography. There are moments of pure hilarity such as when Dulcamara’s grand entrance is interrupted by a dog running across the stage, the villagers spray the quack’s miracle cure over every part of their body imaginable, and Nemorino rolls about the floor with a chorus member. On the other hand, this revival feels more spirited than polished as it relies more on the natural talents of the principals and chorus to carry it off than on any precision engineered direction. A similar point might be applied to Bertrand de Billy’s otherwise splendid conducting as it takes time for the orchestra and chorus really to work as one each time that the latter enters, although when they do the rewards are great. 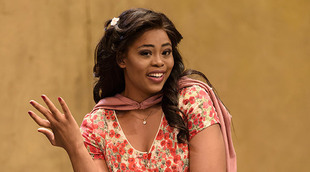 Pretty Yende is a resplendent Adina who reveals a beautifully full soprano and an excellent penchant for comic timing. The principals are, in fact, strong all round and it is interesting how three of them apply quite different slants to their characters to that which we normally see in productions. It is quite common for Nemorinos to look as if they know they are the ‘tenor hero’ and are enjoying playing the ‘village idiot’ but Liparit Avetisyan, who sings the iconic aria ‘Una furtiva lagrima’ very well, enters the part far more convincingly. 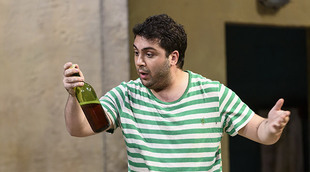 There is a lot of comedy attached to the role of Belcore, but many performers still focus on making him upstanding and arrogant in order to contrast him with Nemorino. Paolo Bordogna, however, with his fine baritone, embraces the comedy so completely that the humour is at a premium when Adina, Nemorino and Belcore interact because all exist within the same frame of reference. Most Dulcamaras have a fatherly, jovial air about them but Alex Esposito plays the character as far more of a ‘bad boy’, complete with dark glasses, designer stubble and tattoos. It works because Esposito, with his splendid bass-baritone, still makes him just enough of a loveable rogue. When he interacts with Adina in Act II there is plenty of chemistry between them, which derives precisely from the fact that she could conceivably be drawn to him as well. Roberto Alagna (and Ivan Magrì), Aleksandra Kurzak and Adam Plachetka play Nemorino, Adina and Belcore respectively for several later performances in the run.